The artists in this summer roundup give rituals and relics a contemporary spin. Ten up-and-coming artists examine the place of rituals and relics in modern life in “Green Honey,” a show curated by former Deitch Projects director Andrea Cashman and artist Borden Capalino. Many of the works hover between fine art and folk object and combine mystical and pop cultural references, giving the gallery’s cavelike basement space the feel of an underground settlement inhabited by the technologically savvy. 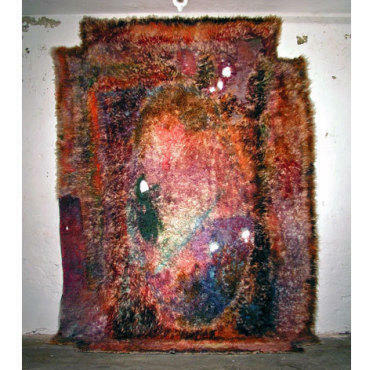 Anna Betbeze’s distressed and overdyed flokati rug is part textile art, part gestural painting. Tony Cox’s talismanic embroideries incorporate scraps of fabric, metal findings and hairpins. Joanna Malinowska’s feather-work wall hanging resembles a Peruvian artifact, if the ancient Peruvians had known about video games. Capalino himself updates the old-fashioned circus sideshow banner with crudely printed digital photographs of snakes. Lucas Blalock, who does fascinating things with commercial-photography tropes, is represented by a mysterious triptych of pictures whose quotidian subjects—an electrical cord, a primitive wooden church, a plastic hoop—have little in common save an inexplicable air of portent. Peter Simensky’s carpet piece, printed with a computer-generated image of a natural spring, includes the dowsing rod he used to find a spot for it. Ruby Sky Stiler weighs in with a pieced-together foam-core amphora; Christian de Vietri with a camper’s pyramid of kindling cast in aluminum. This exhibition has its tongue-in-cheek moments. But its consideration of the process by which objects acquire value—from high-end commodities to lucky beans—makes for a seriously magical summer show.